Scoreboard Logos auto-change based on selected Jersey Edition. For example, you're playing a match between the Warriors & Lakers, then selected the 2018-19 City Edition Jersey for the Warriors & a Statement Edition Jersey for the Lakers; the Scoreboard will feature a Warriors City Edition Logo Variation & a Lakers Statement Edition Logo Variation. See previews below. ONLY COMPATIBLE WITH THE MACKUBEX V15 ROSTERS. 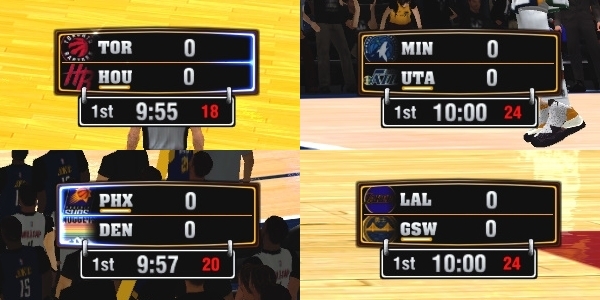 ALL LOGOS ARE ALSO COMPATIBLE WITH THE DEFAULT SCOREBOARD, TNT SCOREBOARD, TSN SCOREBOARD, & AT&T SCOREBOARD.